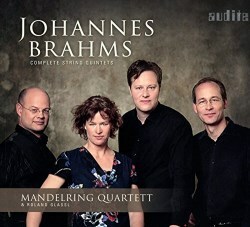 On Audite the Mandelring Quartett with violist Roland Glassl has recorded the Brahms String Quintets, works written when the composer was at the peak of his powers. Brahms displayed a fondness and propensity for composing many of his works in pairs such as the Piano Concertos, Orchestral Serenades, Academic Festival and Tragic Overtures, Cello Sonatas, Song of Fate and Song of Triumph, String Sextets and Piano Quartets. The two String Quintets on this release form part of that pattern, both being written whilst Brahms was on vacation in the Austrian Lakes at the spa town of Bad Ischl, an environment he found very inspiring. Like the string quintets of Mozart, Brahms scored both his String Quintets for two violins, two violas and cello. The selection of two violas is characteristic of Brahms who admired the register and warm texture of the instrument. Brahms projected his Quintet No. 2 in G major as his last chamber work although that proved not to be the case. It was composed in 1890, some eight years later than the F major Quintet, when Brahms was fifty-seven. One contemporary of Brahms even heard in the music “the cheerful, relaxed atmosphere of the Vienna Prater” and the composer corroborated this impression with the reply “Isn't it so! And the many pretty girls in it!” Consequently the four movement score is occasionally known as the ‘Prater’. Feeling upbeat and resolute, the opening movement retains an inspiring dignity. In the contrasting Adagio, the intense disposition of this deeply sorrowful music is compellingly displayed. Marked Un poco Allegretto the third movement, even with its ravishing dance rhythms contains a slight impression of restraint. A spring-like feel pervades the buoyant Final movement, conveying a fulsome sense of freedom and renewal. These are profoundly satisfying performances of both works from the Mandelring and Roland Glassl. Refinement and intense concentration are the watchwords, together with the impeccable unity one has come to expect from these players. Agreeably, if fairly closely, recorded at Konzertsaal, Abtei Marienmünster there is a warm edge to the string sound. There is an excellent booklet essay too, written by Habakuk Traber, that has been translated into English. There are several alternative accounts of these String Quintets in the catalogue worthy of attention. Intensely rewarding is the admirable performance by the Leipziger Streichquartett with violist Hartmut Rohde recorded in 2003 at Lindensaal Markkleeberg on MDG. The Raphael Ensemble, recorded in 1995 at St. Georges, Bristol, on Hyperion and the Hagen Quartet with Gérard Caussé, recorded in 1998 at the Mozarteum, Salzburg on Deutsche Grammophon are worthy accounts providing considerable satisfaction. Nevertheless these are masterclass performances from Mandelring and Roland Glassl standing comparison with the finest recordings. A note in the booklet explains that Mandelring Quartett also plan to record the Brahms Sextets - a project I keenly anticipate.